The bearings are sealed needle bearings, which are mounted on a 45 degree plate. There are rubber "dust" shields that prevent grime getting on to the bearings. The needle bearings alternate between the "vertical" and "horizontal" planes, remembering that they are already as 45° to the normal (horizontal). Dino and Mario Perrotti, as Ofmega, received the patent for this system in 1980 (Italian patent No. 1136016 - international patent code IT11360168). The CX gruppo is highly sought after, as a lot of the components are innovative and extremely well made, but becoming increasingly rare. There are, or appear to be, given Ofmega's ability to produce of the wall coloured components, three colour forms - plain aluminium, black anodised and plain aluminium with a black anodised rim around the bearing races. However, at least one red anodised set has been seen, which is shown on Pinterest and Bike Forums (http://www.bikeforums.net/showthread.php/633077-Ofmega-sealed-bearing-headset-how-to-install-it); so,the assumption that Ofmega made their usual coloured versions (red, blue, gold, plain and black) would probably stand. It would be a good guess that the coloured versions will be "legendary", as they will be fleetingly rare. 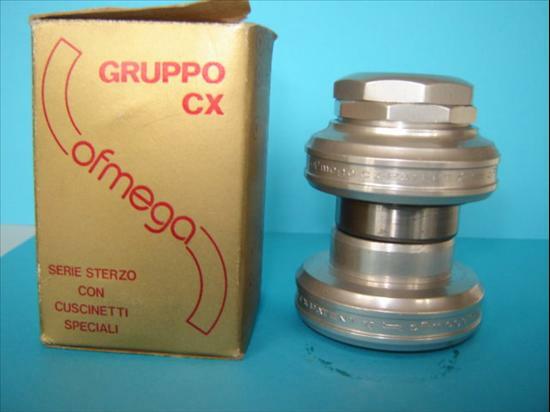 Details: The CX groupset was one of Ofmega's quality groupsets of the early 1980s. As with most Ofmega groupsets, they can often be identified by the colour of the box it came in; in this case a bling gold. It appears that the Mistral and CX groupsets were inter-changeable, hence the Mistral track pedals being the same as and in the same boxes as the CX pedals. It would seem that CX was intended more for track racing, hence there are no CX dérailleurs, and Mistral for road racing.